Suspected Al-Qaida Militants Strike Hotel In Burkina Faso : The Two-Way The gunmen attacked a hotel and a cafe in Ouagadougou, the capital of the West African nation. The foreign minister says people have died. Al-Qaida in the Islamic Maghreb has claimed responsibility. A soldier stands near a hotel that was attacked by militants on Friday in Burkina Faso's capital, Ouagadougou. 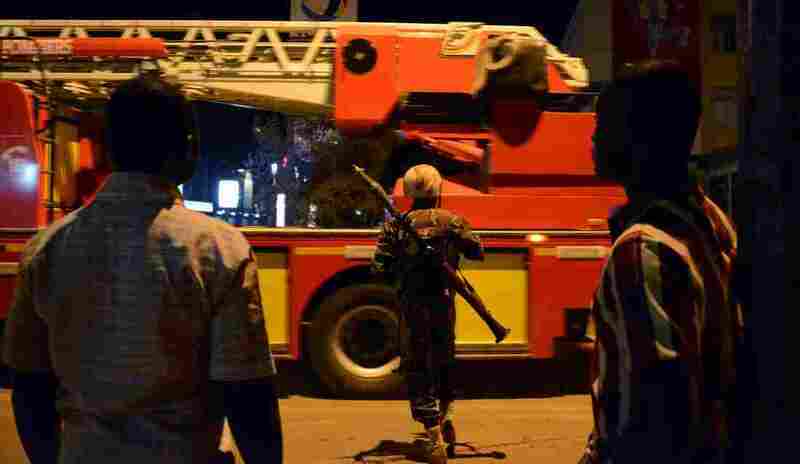 Militants have struck an upscale hotel in Ouagadougou, the capital city of Burkina Faso in West Africa. They also attacked a nearby cafe. Wire services quote a hospital official as estimating that 20 people may have been killed. He got that figure from talking to survivors. Reuters reports the gunmen stormed the five-story Splendid Hotel, burning cars outside and firing in the air to drive back crowds before security forces arrived, prompting an intense exchange of gunfire. NPR's Ofeibea Quist-Arcton reports witnesses say security forces eventually entered the main lobby of the hotel and part of the foyer was on fire. Media reports quote officials as saying a government minister was one of a number of hostages freed from the hotel. Ofeibea reports that the hotel is one favored by foreigners, including U.N. workers and French soldiers based in the region. According to the SITE Intelligence Group, al-Qaida in the Islamic Maghreb, known as AQIM, claimed responsibility for the attack online. "Parallels are being drawn with a similar hostage attack in neighboring Mali in November, when Malians and foreigners were killed in a hotel hostage drama," Ofeibea says. "Al-Mourabitoun, linked to al-Qaida, said it was behind the deadly attack in Mali." A U.S. defense official told NPR that AFRICOM, the U.S. command in Africa, is monitoring it closely. The official said Defense Department personnel are accounted for and there are no U.S. military people in the hotel. "The United States strongly condemns the attack in Ouagadougou, Burkina Faso. We extend our deepest condolences to the families of the victims during this senseless assault on innocent people. "The U.S. Embassy in Ouagadougou is providing all possible consular assistance. W‎e can confirm that all Chief of Mission personnel are accounted for. "Our Embassy in Ouagadougou is making every effort to account for U.S. citizens in the city. Privacy considerations would prevent us from commenting on any specific case absent written authorization."